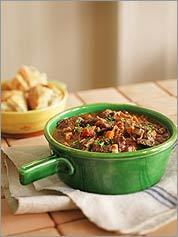 Three classic French beef stews. Beef stew figures heavily in French cooking. A simple stew of beef and carrots is found throughout the country, while the various regions feature similarly prepared stews based on their wines and other local ingredients. Daube Provencale uses anchovy, orange, tomato, and olives, all common in Provence. Boeuf Bourguignon, from Burgundy, must include that area’s famous wine made from the pinot noir grape, and a garnish of pearl onions and mushrooms. Serve with buttered noodles or roasted potatoes. Finely chop 3 carrots and set aside. Cut remaining carrots into pieces about 3 inches long and 1 inch thick and set aside separately. In medium bowl, toss beef with 1 teaspoon each salt and pepper, and flour to coat. In large, heavy-bottomed Dutch oven, heat oil over medium-high heat until it ripples. Reduce heat to medium-low, add bacon, and cook, stirring occasionally, until crisp, about 9 minutes. Remove bacon, drain, and reserve; pour off all but 2 teaspoons of fat into a small bowl and reserve. Return pot to medium-high heat and heat until fat begins to bubble, about 40 seconds. Add half the beef, so that pieces are close together in a single layer but not touching, and cook without moving them until deeply browned on bottom, about 3½ minutes. Turn and cook until second side is deeply browned, 3½ minutes longer; transfer beef to a medium bowl. Add 2 teaspoons reserved bacon fat to pot, and repeat process with remaining beef (reduce heat if drippings begin to burn); transfer to bowl with first batch. 1 teaspoon salt, submerge the carrots, replace cover, and continue to simmer until beef and carrots are tender, about 2 hours longer. Add reserved bacon to pot and continue to simmer for 5 minutes. Remove bay leaves. Taste stew and adjust seasoning with salt and pepper, if necessary. Add 4 tablespoons of parsley, stir to combine, and serve at once, sprinkling each portion with the remaining parsley. 1) Substitute 4 ounces pancetta, cut into ½-inch pieces, for bacon. 2) Omit the 12 carrots cut into large pieces and reduce onions to 2, chopping them roughly. 3) Along with the garlic, thyme, and bay leaves, add 2 tablespoons tomato paste and the zest from 1 large orange, cut into thin strips. 4) Omit brandy. Substitute medium-bodied red wine, such as cabernet sauvignon, Cotes du Rhone, or zinfandel for the white wine. 5) Toward end of cooking, add 4 finely chopped anchovy fillets, ½ cup black nicoise olives, pitted and halved, and 1 14½-ounce can diced tomatoes, drained, along with the reserved pancetta, stir to mix, cover the pot, increase heat to medium and cook until olives and tomatoes are heated through, about 5 minutes. Add parsley to pot as above, and serve individual portions garnished with parsley. 1) Omit the 12 carrots cut into large pieces and reduce onions to 2, chopping them roughly. 2) Along with garlic, thyme, and bay leaves, add 1 tablespoon tomato paste. 3) Omit the ½ cup brandy, increase chicken broth to 1 cup, and substitute 2½ cups Burgundy or pinot noir for the white wine. 4) Once beef is tender, transfer it to a large bowl and set aside. Strain mixture left in pot, pressing on solids; you should have about 3 cups liquid. Discard solids and return liquid to pot, bring to boil over medium-high heat and cook, stirring occasionally, until sauce is reduced to about 2 cups, about 9 minutes; adjust the heat to low. 5) While sauce reduces, in a large skillet over medium heat, bring another ¼ cup chicken broth and 2 teaspoons reserved bacon fat to a boil. Add 8 ounces frozen pearl onions and ¼ teaspoon salt, and cook, stirring occasionally, until tender, about 3 minutes. Adjust heat to medium-high and cook, stirring frequently, until liquid evaporates and onions darken slightly, about 3 minutes longer. Add 1 teaspoon reserved bacon fat and 1 pound halved crimini mushrooms, and cook, stirring occasionally, until their liquid evaporates and they brown, about 10 minutes. Add onions and mushrooms to the bowl with the beef. Return skillet to medium-high heat, add ½ cup wine and, using a wooden spoon, scrape bottom of skillet until brown film loosens and mixes into the liquid. Add liquid to the sauce in the pot. 6) Add beef, onions, mushrooms, reserved bacon, and 1 tablespoon brandy to the sauce in the pot, adjust heat to medium, and cook, stirring occasionally, until heated through, about 10 minutes. Taste stew and adjust seasoning with salt and pepper, if necessary. Add parsley to pot and portions as previously. (Photograph by Jim Scherer; Styling by Catrine Kelty) HOT POT Beef stew with carrots is a dish served all over France. For stews and many other dishes, French bacon is cut into small pieces called lardons (a term also used for small pieces of pure pork fat, with no lean). But American bacon is a poor substitute, as it is both sweeter and smokier than French bacon. To mimic French bacon’s flavor, you can use pancetta, which is neither sweetened nor smoked, or you can blanch thick-cut or slab American bacon to mute its smokiness and saltiness. To do so, simply simmer the bacon in a pot of water over medium-high heat for about 10 minutes. Remove the blanched bacon, dry it with paper towel, and cut it into thin strips. Then use it in any recipe as you would lardons. For stews and many other dishes, French bacon is cut into small pieces called lardons (a term also used for small pieces of pure pork fat, with no lean). But American bacon is a poor substitute, as it is both sweeter and smokier than French bacon. To mimic French bacon’s flavor, you can use pancetta, which is neither sweetened nor smoked, or you can blanch thick-cut or slab American bacon to mute its smokiness and saltiness. To do so, simply simmer the bacon in a pot of water over medium-high heat for about 10 minutes. Remove the blanched bacon, dry it with paper towel, and cut it into thin strips. Then use it in any recipe as you would lardons.